True North: Cherry Festival...a big deal, believe it or not. Well, we've lived in this town for 6 years and have finally seen one of the parades. Where have we been???? This was so, so fun and the kids are at just the right age to be able to enjoy it! 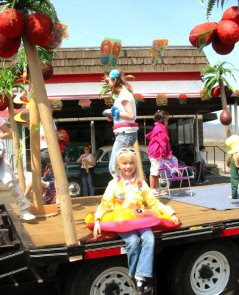 Megan's school had a float and she was chosen as one of the kids to ride on it- the theme was 'Fun in The Sun' and she outfitted herself accordingly with sunglasses, lei and 'fishy' pool toy. I'm looking at this picture and can hardly believe that's my daughter!! Where has the time gone? Summer and Noah had a great time eating pastries from the little French bakery across from where we were sitting and trying to catch as much of the candy as possible from passing floats. There was only one incident of Noah running into the middle of the parade after Megan's float went by, so I figure we did well. It was really a day to reflect on how grown up Meg's becoming. Especially since after going home that afternoon, she promptly lost her first tooth. She has immediately set to work on the rest of them and it is my prediction that she will be toothless by Christmas. The whole event gave us such a sense of community and stability- even though our 'little girl' was suddenly taking such strides. And for all you Portlander's, note the glorious blue skies. It was a whopping 75 here in town that day. And I say with delight: Neener, Neener, Neener.